The south-eastern-most district of Volgograd, southern Russia, that for some may be worth the effort it takes to get there, namely for two things: the world's tallest Lenin statue and the grandiose gate over the locks where the Volga-Don Canal meets the mighty Volga River. More background info: Krasnoarmeysk, named after (you will have guessed it) the Red Army, is one of the youngest districts of Volgograd – and at the same time one of the oldest. Explanation: it was here that an 18th century Volga German settlement called Sarepta had existed independently from then Tsaritsyn and a good distance from it (see below), but as the city grew, Sarepta was integrated into it administratively in the 20th century and renamed Krasnoarmeysk. The 20th century also saw the arrival of plenty of industry – and of the Volga-Don Canal, one of the grand industrialization and infrastructure modernization projects initiated under Stalin and pushed through with much force. The project was actually begun before WWII, but the war quickly put a halt to it. Work was continued from 1948 and in a remarkably short span of time the canal was completed and operational by June 1952. There is a dark element in this: the enormous workforce required to build the canal at such speed included some 100,000 German POWs and as many Gulag prisoners. As an incentive for the latter, a day's work on the canal counted as three days in prison, thus shortening a prisoner's term significantly. The canal, which provides an important connection between the Caspian Sea (via the Volga) and the Black Sea (via the River Don) was originally named after Lenin, but the addition “Imeni V.I. Lenina” has meanwhile been dropped. The association with Lenin, if only in name, however, explains why the giant Lenin statue was built overlooking the Volga River at the end of the canal. At 27 metres (almost 90 feet) it is in fact the largest Lenin statue in the world. It was designed by the same sculptor who had already created the Rodina Mat statue on Mamayev Hill in the north of Volgograd in 1959. His Lenin was unveiled in 1973. Originally, however, it was a giant Stalin that used to stand here, erected when the Volga-Don Canal was finished. But this 24m-high Stalin was demolished as part of the campaign for de-Stalinization at the same time that Stalingrad was renamed Volgograd. And before the even more gigantic Lenin took over this position, the pedestal remained unoccupied. Volgograd's bizarre Stalin Museum features some photos of the former Stalin monument. Volgograd really digs big statues. 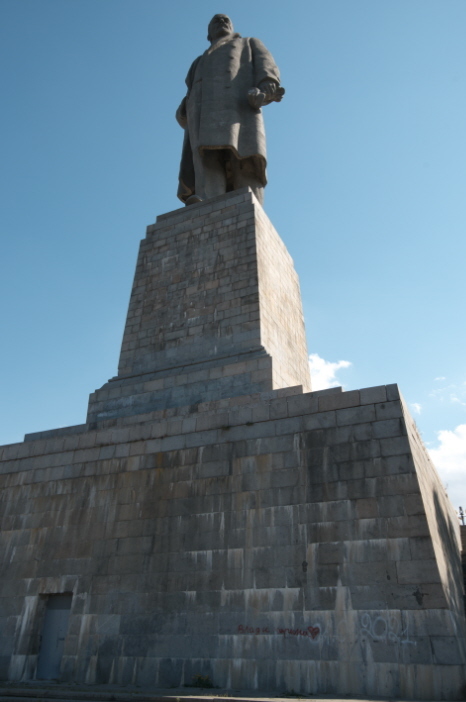 Not only does it have the largest statue in Europe (and largest of a woman worldwide) with Rodina Mat on Mamayev Kurgan, it also boasts the largest Lenin statue in the world. However, this Big Lenin is a lot harder to get to, being located in the south-eastern-most district of the city, Krasnoarmeysk. The arduous route is described in detail below. Whether it's worth the time and effort, everyone has to decide for themselves. I'm glad I did take the time; it was one of the more unusual things I did on my summer 2017 Russia trip. Getting a good look at the big gate above the lock connecting the Volga-Don Canal to the Volga River was an added bonus. In addition I found the train journey a kind of attraction in itself. It may sound weird to some, but if you're like me and enjoy the look of rusting old industrial landscapes, then you too might enjoy the route where it goes straight through a number of chemical plants between central Volgograd and Krasnoarmeysk, in particular the huge “Khimprom” plant. (That's also a bonus of the elektrichka trains over buses or marshrutkas!). Eventually coming to the bridge over the canal was the next highlight, as it affords good views into the large lock connecting the Volga-Don Canal to the river beyond. The same is true for the walk alongside the canal towards Lenin. The gigantic ornamental gate towering over the lock is a sublime example of Stalinist-era Soviet architecture, in fact, well worth a look from different angles. But the highlight of it all is of course finally getting to the Giant Lenin – in fact you can already see him looming large in the distance in between the residential blocks from the canal bridge. But he's even more impressive from close up. This is a comparatively calm and contemplative-looking Lenin, quite unlike the many smaller Lenins you find on squares all over Russia to this day, which typically show him in flamboyant poses as if in the middle of delivering a fiery speech. This one just quietly looks out over the Volga, one hand on his hip, the other clasping his iconic cap. And he really is BIG – underscored by his pedestal that's almost as tall as the statue, bringing it to something like 50 metres (165 feet) in total. Unfortunately his gaze goes northward, meaning that during the day he is “backlit” by the sun, his face in the shade, which isn't good for photography. But so what. He's still very impressive to behold. By the way, an alternative way of seeing this Lenin statue is from the water – there are pleasure boat cruises down the Volga up to this point. But I didn't have the time to embark (literally) on any of these, so I can't say much about them. But I know that some organized package tours including Volgograd often have a boat ride down the river included as part of the itinerary. Location: At the point where the Volga River and the Volga-Don Canal meet, at the south-eastern end of Volgograd, at the tip of the lower L shape that this strangely-laid-out city forms along the banks of the Volga. Access and costs: quite off the beaten track, far from the city centre, and an effort to get to; but free (except for the train fare). Details: Getting to the attractions in Krasnoarmeysk is a bit of a challenge. The best and fastest way is to get an elektrichka regional train from Volgograd main station (Volgograd-1) – or rather: from the regional train station just behind the main station building. You have to use the underpass to the left of the main building and the stairs to the left at the end of the tunnel. Get your tickets from there. If you don't speak Russian, that's the first hurdle, as it's unlikely that any of the women behind the ticket windows will speak English. You could try with your hands and feet and maybe it'll help having the name of the stop Krasnoarmeysk written down on a piece of paper in Cyrillic (Красноармейск) to show at the ticket counter. You'll also have to find out what times the trains are – also for the journey back – so there's the next hurdle for non-Russian-speakers. If I remember correctly they depart roughly every other hour, but might be more frequent in the morning and late afternoon/evening (these are primarily commuter trains, after all). Anyway, tickets are cheap and the ride lasts about 45-50 minutes. Note that the trains don't terminate at Kransoarmeysk, but go on to a place called Yuzhnaya, and it will say that at the front of the train (Южная – that's at the end of the line right in the middle of an oil refinery complex; you do not want to get stranded there!). So you have to pay attention when you get close to Kransoarmeysk – and maybe ask a fellow passenger to confirm you're at the right stop. There are no announcements on the train, nor do many of the stops have any signs. Enter the next complication! Also note that if you want to go to the Sarepta museum and church (see combinations!) that the stop called Sarepta (and that's one that does have a sign and a station building!) is NOT the one where you want to get out; you still want the Kransoarmeysk stop – which is two stops after Sarepta station (in between is 'Sudoverf'). But that at least helps in knowing when to get ready to get off the train. The stops on this stretch suddenly come in quick succession – so once you've spotted the Sarepta station (Сарепта) you know you have to get ready. As an alternative to the elektrichka you could try marshrutkas (minibus fixed-route taxis) or buses/trolleybuses, but you'd probably have to change and the whole journey would last at least an hour and has great potential for complications. Better stick to the train. From the train stop – which doesn't have a proper platform on this side! – walk in the direction the train was going and find the little passage to the street on the left. Turn round and memorize its location. There are no signs whatsoever and looking at it from the street you'd never guess this little path would take you to a railway station or indeed anywhere other than perhaps a private garden (see the relevant photo in the gallery below!). Once you've got that done, the long walk starts. First proceed straight on along Bulvar Engel'sa until you come to the main thoroughfare, Prospekt Geroyev Stalingradskaya (or 'Heroes of Stalingrad Boulevard'). Take this towards the east (right) and cross the bridge taking you over the Volga-Don Canal – you get a good view of the locks from the crest of the bridge. In theory you could get a trolleybus for that part of the route, but that would probably add more complications than it's worth. At the other end of the bridge turn left and keep going along Ulitsa Fadeyeva – or the strip of landscaped garden running parallel to it – and eventually you get to the big Lenin. The return journey is the same, just in reverse. And when you get to the station, you'll need the other track for the journey back to Volgograd-1. On that side the stop does have a platform and even a little station building (with a ticket window). Time required: at least four hours, probably more, depending on train connections and your walking speed. Combinations with other dark destinations: see under Volgograd. Combinations with non-dark destinations: There is in fact one obscure little cultural attraction here, one that could be of particular interest to Germans: Sarepta, one of the earliest 18th century settlements of Volga Germans (see also under Volgograd >background). Though the efforts of the Protestant missionaries failed (the local Kalmyk people were instead absorbed into the Orthodox church), the settlers were successful in economic terms, having been granted privileges and wide-ranging autonomy by Tsarina Catherine the Great's decree through which she attracted German settlers to Russia. Yet with the October Revolution of 1917 these privileges and their autonomous administration ended and a part of Sarepta was integrated into Tsaritsyn (before it was renamed Stalingrad). The rest of Sarepta was integrated into the district of Krasnoarmeysk in 1945. Only a few of the old German buildings survived, many were demolished; but from the late 1980s efforts were made to preserve what was left. Now there are a couple of restored buildings, including the church, which dates back to 1780, making it Volgograd's oldest building. Next door is a small museum about Sarepta (open Tue-Sun 9 a.m. to 5 p.m., 200 RUB) with a library attached. Sarepta could be slotted in en route to/from the big Lenin and the canal: it's just a short walk south of the western end of the bridge over the canal, down Izobilnaya Ulitsa and then right. There's not much else to do out here in Krasnoarmeysk, except perhaps the option of going for a swim in the Volga on a hot summer day, just as the locals do, or getting a boat across to the beaches on the opposite banks of the river (if your Russian language skills are up to negotiating such things). Otherwise it's back to the centre of Volgograd.